← You can’t get there from here. 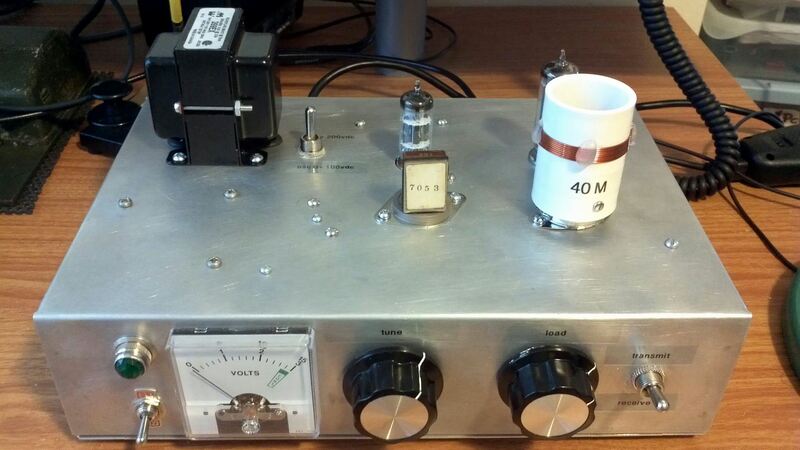 This post is the last in a series about building a vintage tube transmitter. All ham radio, not a smidge of Linux. The most exciting, and anxiety provoking moment in a homebrew project is the “smoke test.” That moment when the construction work is done, the new device is sitting on the bench, hooked up to power, antenna and key, ready to demonstrate that all that planning and effort were worth it. It can be a moment of triumph, or despair. Output! Nice note, keying sounded good in a nearby receiver… but not a lot of output. I was expecting about 4 – 5 watts, a healthy QRP signal, but at the max I was seeing about 1 watt, maybe 1 1/2 watts. Now admittedly at low power the difference between 1 1/2 and 4 watts is not a big deal, but I had the sense that something was not as it should be. I was pretty sure my home-made coil was okay. I had measured the inductance using my LC meter, and it was spot on for the coil specifications. Further, I had tested the coil mounted on the transmitter with a grid-dip meter, a device that measures resonance, and it showed the coil resonant on the 40 meter band. So it wasn’t the coil. Well, okay, according to the excellent project manual from Ralph Taggart, WB8DQT that was the guide for this project, I should be prepared to add capacitors to the output variable capacitor in the tank circuit, if the maximum output was obtained with the plates of the cap fully meshed. That certainly described what I was seeing, so I then embarked on the aerobic exercise portion of the project. Down two flights of stairs to my basement workbench, add a cap to the output variable, back up two flights of stairs to my operating position to try again. Lather, rinse, repeat. I was adding a huge amount of capacitance to the output variable cap, with not much beneficial effect. Without any effect, in fact. Something was really wrong here, time to return to the internet. I read everything I could find about tank circuits. The tank circuit is what connects the output of the final amplifier tube to the antenna, and it turns out that it is a relatively recent invention in the history of the radio arts. Tank circuits became commonplace in transmitter and amplifier designs with the rising popularity of the use of coaxial cable, or “coax” to connect antennas to radios. 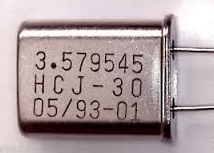 The purpose of the tank circuit is to match the high-impedance output of the tube, to the low impedance of the coaxial cable. When the impedances are matched, the maximum amount of power is transferred from the tube to the antenna. When they are not matched, you get anemic output, and the tube glows in funny, self-destructive ways. the output variable cap now started to have an effect. I was able to find the right amount of capacitance to add to get it to peak at the midpoint of the adjustment. Good stuff, but I still wasn’t satisfied. 2 watts isn’t 4 – 5, I still thought there were issues. I sent an email to Ralph, WB8DQT, author of the design, and described my plight. He had be very forthcoming in helping me with some earlier questions, so I was hopeful he could guide me to a solution. Ralph replied suggesting a few things I could try to get a bit more power out of the transmitter, but basically said that it sounded like it was up and running. While investigating one of the changes Ralph suggested, I was examining the wiring of the amplifier tube socket, and discovered that I had omitted a connection! The amplifier tube is a pentode, a 5763, and the suppressor grid pin was supposed to be grounded. I had left this connection out. Adding this connection made a big difference! I was now getting about 3 1/2 watts from my vintage 40 meter crystal. At this point I figured I was finished, and would have been, but for a chance experiment. I have a few modern, HC49 style crystals hanging about, and just for fun I decided to take one and jam the leads into the crystal socket to see how it would work. Wow! 5 plus watts out, a veritable QRP powerhouse! Then it dawned on me. Ralph’s design, with the reduced plate voltage to the oscillator, was intended to optimize the operation with modern crystals. The modern crystals have much less mass than the old, FT-243 style crystals. I bet the reduced plate voltage was not driving enough current through the old crystals to produce full output. I then embarked on the final modification to my transmitter. I added another regulation circuit for 200 volts to the oscillator plate, and a switch to select between 100 volts and 200 volts on the oscillator plate. Voila, a “vintage” – “modern” crystal switch. This modification worked beautifully. I am now getting 4 – 5 watts out with vintage crystals running at 200 volts, and can use modern crystals (fitted into empty FT-243 holders) with the 100 volt setting. This transmitter is ready for anything. It has been an very exciting and interesting project. I have learned a lot about working with tubes, and had fun troubleshooting the rig. It’s now ready for Straight Key Night, and all those SKCC sprints. This entry was posted in Ham Radio and tagged Amateur radio, Homebrew, low power, QRP, QRP operation, transmitter. Bookmark the permalink.